Some would say we are a nation in crisis. Our leaders are on trial, our teenagers are turning to violence and drugs, and families are splintering around us. Yet, according to Gordon B. Hinckley, president of the Church of Jesus Christ of Latter-day Saints, one cannot lose hope. The solution lies not within our governments, schools, or symbols of popular culture, but rather within ourselves, our families and our faith. President Hinckley stresses the significance of values such as civility, forgiveness and integrity in our daily lives. Drawing on the lessons of history as well as anecdotes from his own life, he creates a thoughtful and provocative discourse on the state of our society and our responsibility to one another. At once masterful and illuminating, Standing for Something: 10 Neglected Virtues That Will Heal Our Hearts and Homes is a work for our time, a reflection on one man's long and productive life. It does not dwell on the values of the past; rather, it provides a moral and spiritual map toward a brighter future. "Love is the only force that can erase the differences between people or bridge the chasms of bitterness." "In our day, those found in dishonesty aren't put to death, but something within them dies. Conscience chokes, character withers, self-respect vanishes, integrity dies. How cheaply some men and women sell their good names!" "Both experience and divine wisdom dictate that moral virtue and cleanliness pave the way that leads to strength of character, peace of mind and heart, and happiness in life." "Civility carries with it the essence of courtesy, politeness, and consideration of others. All of the education and accomplishments in the world will not count for much unless they are accompanied by marks of gentility, of respect for others, of going the extra mile." "No matter how old we become, we can acquire knowledge and use it. We can gather wisdom and profit from it. We can grow and progress and improve — and, in the process, strengthen the lives of those within our circle of influence." "Hatred always fails and bitterness always destroys. Are there virtues more in need of application in our day, a time marked by litigious proceedings and heated exchanges, than those of forgiving, forgetting, and extending mercy to those who may have wronged us or let us down?" "I commend to all the virtues of industry and thrift, which I believe go hand in hand. The labor and thrift of the people make a nation, a community, or a family strong. Work and thrift make the family independent." "Gratitude is the beginning of civility, of decency and goodness, of a recognition that we cannot afford to be arrogant. We should walk with the knowledge that we will need help every step of the way." "My plea is that we stop seeking out the storms and enjoy more fully the sunlight. I am suggesting that as we go through life, we 'accentuate the positive.' I am asking that we look a little deeper for the good, that we still our voices of insult and sarcasm, that we more generously compliment and endorse virtue and effort." "Great buildings were never constructed on uncertain foundations. Great causes were never brought to success by vacillating leaders. Faith has always been, and always must be, at the root of any meaningful practice and endeavor." 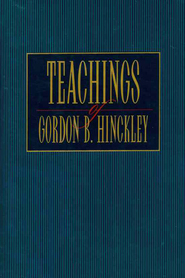 President Gordon B. Hinckley was ordained and set apart as the fifteenth president of The Church of Jesus Christ of Latter-day Saints in 1995. He had previously served as a counselor in the First Presidency for fourteen years and for an additional twenty years in the Quorum of the Twelve. As a civic leader and longtime Church worker, Marjorie Pay Hinckley traveled the world with her husband, speaking at seminars, conferences, and the dedicatory services of more than twenty temples. The Hinckleys, who were married for more than sixty years, are the parents of five. Sister Hinckley passed away April 6, 2004, at the age of 92. President Hinckley passed away January 27, 2008, at the age of 97. Awesome Book to improve your life and feel inspired! The book, “Standing for Something” is one of the best books that I have read. 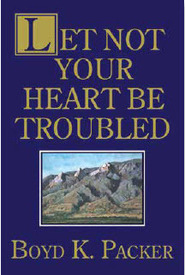 I love to learn from President Hinckley and really enjoyed reading this book. I felt that the way that each virtue is portrayed is done is a very loving way and also shared with some personal experiences of the prophet. This book has helped me recognize ways that I need to improve individually. It also teaches how to improve a society as a whole. This book is also very quotable and has very strong statements that give you a lot to think about. One of my favorite quotes includes this. “The best antidote I know for worry is work. The best cure for weariness is the challenge of helping someone who is even more tired. One of the great ironies of life is this: He or she who serves almost always benefits more than he or she who is served.” Book that is uplifting and worth your time! I learn something new ever time I pick up this book. Pres. Hinckley wrote this for all to know that we all must stand for something or fall for anything. I've read this book 3+ times and still find new insights and ideas to make my life better. I've also given this book to many friends (LDS and not) who have enjoyed it and used it in speeches given in my community. It is truly an inspired book and I wish more people would read it. Anything virtuous, lovely, of good report or praise worthy. We seek after these things. This book reminds us to instill virtue into our every action. Thankyou for such a beautiful book. It will insprie the very least of us. An insightful work from our beloved prophet. This book touches on many things that are so pertinent in these times - so many values and morals that seem to be lost in common society. With characteristic straight-forwardness, optimism, and humor, President Hinckley delivers a masterful lesson on the actions and attitudes that will bless our nation. He details each of his ten values with intriguing life experiences and powerful, heart-reaching messages. It serves as a superb standard for renewing perspective and seeking first the kingdom of God.